Mickey Hart (born September 11, 1943) Mickey Hart is best known for his nearly three decades as an integral part of an extraordinary expedition into the soul and spirit of music, disguised as the rock and roll band the Grateful Dead. As half of the percussion tandem known as the Rhythm Devils, Mickey and Bill Kreutzmann transcended the conventions of rock drumming. Their extended polyrhythmic excursions were highlights of Grateful Dead shows, introducing the band's audience to an ever-growing arsenal of percussion instruments from around the world. Exposure to these exotic sounds fueled Mickey's desire to learn about the various cultures that produced them. With Mysterium Tremendum, Hart is pushing the boundaries of what we know as music, creating a genre of his own. "I have always thought of life, the world at large, as music," says Hart. "This work is a representation of that notion. I have combined sonic images of the formation of our universe with sounds drawn from musical instruments. It's all about the vibrations that make up the infinite universe. In this case, they began as light waves and these light waves are still washing over us. Scientists at Penn State, Lawrence Berkeley Labs, and Meyer Sound have transformed these light waves into sound waves. These musical excursions transport me to wonderful and strange new places filled with rhythms for a new day. The combination of music from the whole earth and the sounds of the planets, the stars, the events that formed our universe is intoxicating and points toward an awareness of what music is, could be, and where it comes from. " For this new work Hart joined with long time Grateful Dead lyricist Robert Hunter. "Hunter is a bold visionary writer who knows where I am going with this music," says Hart. " He is indispensable to the weave of this story. The way he writes, the imagery and mythology, are perfect for this project. Nobody writes like Robert Hunter." 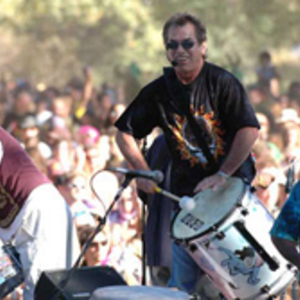 On Mysterium Tremendum, the Mickey Hart Band consists of Widespread Panic bassist Dave Schools, Grammy winning percussionist and longtime band mate Sikiru Adepoju, Tony Award winning vocalist Crystal Monee Hall, singer Tim Hockenberry, drummer Ian "Inx" Herman, guitarist Gawain Matthews, and keyboardist / producer, Ben Yonas.JamBands.com gave the band's recent tour stop in NYC rave reviews stating that "Mickey Hart is nothing short of a musical genius and it shines through in everything he does. Whether he's working with George Lucas, NASA, or throwing together a unique group of musicians for a band, its apparent that Mickey isn't satisfied doing the same old thing...". Mysterium Tremendum was released by Hart's own 360? Productions. The album, recorded at Hart's Studio X in Sonoma County, CA, was co-produced by Hart and Ben Yonas. Special guests Steve Kimock, Reed Mathis appear on select tracks as well as long time collaborators, Zakir Hussain, and Giovanni Hidalgo. On October 11, 2011, Smithsonian Folkways Recordings released the 'Mickey Hart Collection' to preserve and further the Grateful Dead percussionist's endeavor to cross borders and expand musical horizons. Smithsonian Folkways have made many of Mickey Hart's music projects available digitally (stream and download) for the first time while keeping physical versions in print as on-demand CDs. The Mickey Hart Collection begins with 25 albums drawn from 'The World,' a series Hart curated that incorporated his solo projects, other artists' productions, and re-releases of out-of- print titles. Six of the twenty-five albums form the "Endangered Music Project," a collaboration between Mickey Hart and the American Folklife Center at the Library of Congress, which presents recordings from musical traditions at risk. Both 'The World' and 'The Endangered Music Project' were previously distributed by Rykodisc from 1988 to 2002. His tireless study of the world's music led Mickey to many great teachers and collaborators, including his partners in Planet Drum Zakir Hussain, Babatunde Olatunji, and Airto Moreira. Planet Drum's self-titled album not only hit #1 on the Billboard World Music Chart, remaining there for 26 weeks, it also received the Grammy for Best World Music Album in 1991-- the first Grammy ever awarded in this category. Hart last released the Global Drum Project with Zakir Hussain, Sikiru Adepoju, and Giovanni Hidalgo in 2007, which took home the Grammy for Best Contemporary World Music Album. Mickey's experiences have paved the way for unique opportunities beyond the music industry. In 2008, he and Planet Drum partner Zakir Hussain composed a thrilling backbeat to the new Volcano at the Mirage Hotel in Las Vegas, NV. He composed a major drum production performed by an assembly of 100 percussionists for the opening ceremony of the 1996 Centennial Olympic Games. Additionally, Mickey has composed scores, soundtracks and theme for a number of award-winning films and television shows including Apocalypse Now, Gang Related, Hearts of Darkness, The Twilight Zone, the 1987 score to The America's Cup: The Walter Cronkite Report, Vietnam: A Television History, and The Next Step. Mickey has written four books documenting his lifelong fascination with the history and mythology of music. These include Drumming at the Edge of Magic, Planet Drum, and Spirit into Sound: The Magic of Music. His latest book, Song catchers: In Search of the World's Music published by National Geographic Books, traces the 100-year evolution of recording technology, creating vivid portraits of the pioneers who traveled far and wide collecting the world's music. Long a social activist, Mickey appeared in August 1991 before the U.S. Senate Committee on Aging, speaking on the healing value of drumming and rhythm on afflictions associated with aging. He followed that speech with Rhythm For Life, a 2000 person drum circle at the College of Marin, where he was joined by Carlos Santana, Shiela E, Hamza El Din, Airto, and Flora Purim, and in the Fall of 2004, broke the Guinness World Record: Largest Drum Ensemble for his 5000 person drum circle, also in Northern California. Mickey currently serves on the board of "Music and the Brain" at Institute for Music and Neurologic Function at Beth Abraham Hospital. In 1999, Mickey was appointed to the Board of Trustees of the American Folklife Center at the Library of Congress where he headed the sub-committee on the digitization and preservation of the Center's vast collections. There he helped to establish the "Save Our Sounds" project, a collaboration between the AFC and the Smithsonian's Center for Folklife and Cultural Heritage, where he currently serves as member of the board of directors. Mickey has been honored repeatedly for his contributions. The Grateful Dead was inducted into the Rock and Roll Hall of Fame in 1994, and in 2007 along with the other members of the Grateful Dead, Mickey received a Grammy Lifetime Achievement award. Other honors include, in 2009, Mickey was inducted into the Percussive Arts Society Hall of Fame. In 2004 he received the NARAS SF Chapter Governors Award, in 2002 Surround Music Awards Best Multi-track Reissue for Grateful Dead American Beauty, and in 2003 a Music Has Power Award, In October of 2000, the Saybrook Graduate School and Research Center conferred an honorary doctorate of humane letters upon Mickey for his work in advancing the preservation of aural archives.